Olivia is a Super Smart Princess who Experiments With Science. Rowan is a Cool Robot who Plays With Ooey Gooey Things. They just found out that their friend Wiffle has been captured by saw-toothed witches deep in DragonSnot Falls! They`re the only ones who can enter Storia and save Wiffle - how will they do it? It`s all up to them! No Thank You, Evil! 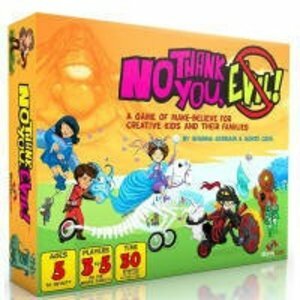 is tabletop game of make-believe, adventure, and storytelling for creative young minds and their families.